My Thoughts: Okay seriously, how to even write this review. Legend was flat out awesome! I picked this book up and I didn't want to put it down! If your a fan of The Hunger Games, you will probably enjoy it. It has that same feel to it but it is so different at the same time. It's freaking wonderful! We are introduced to Day and June. June works for the Republic. The Republic is pretty much the people who run everything, a type of government. She also has a brother named Metias who is killed pretty early on in the book. We can tell how much they loved each other and how close they were as brother and sister. June is the only one who scored a perfect on her Trial Test. She is the Republic’s prodigy . Than we meet Day. Day is the world's most wanted criminal. He has committed several crimes (or so they say) and he is wanted by The Republic. After June's brother is brutally murdered by Day, June sets out on a mission to find him and bring him in to be put to death- execution style. She soon starts tracking him in the Slums sector and runs into him and his friend Tess. Tess is a 13 year old girl that Day found one day and took in. She's been running with him ever since. She's sort of a little sister type. Day is out to get plague vaccinations for his family. This is all he cares about right now. Even though his brother John knows he's alive, the rest of his family believe him to be dead. As June gets to know Day, she discovers secrets she never even imagined. Deadly secrets that can change the course of life. They can change every one's way of looking at things, all people could lose respect for The Republic. I won't say much else about the plague, the secrets, Day and June's family. I will just say that I loved both of these characters. They were such awesome teens. Legend was such an emotional read for me. It was addicting. It was marvelous. 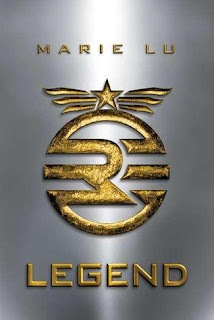 Legend was one of the best books I've read this year! Overall: Loved It! Legend was so freaking cool. It was so amazing! I loved the world building, I loved the characters, I loved reading about the different sectors and what went on in each sector. 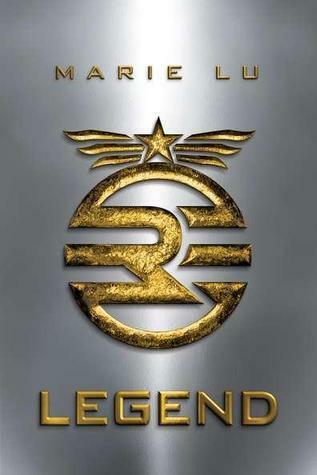 Legend is a book you have to read this year!!!! It's definitely a book to buy! Cover: The cover is kind of sparkly. It is plain but really fits the book. It is a nice cover to go along with the story. I have yet to read this book. I have had it on my shelf for the past two months. I'm so glad you enjoyed this book and you are making me wish I had already read it! DEFINITELY have been wanting to read this book! I have a thing for siblings-in-trouble/out-for-revenge type plots. So that, coupled with all the other neat world building elements I've read about makes this one sound like one helluva good read.